LEVEL: easy Cook: 24 approx. 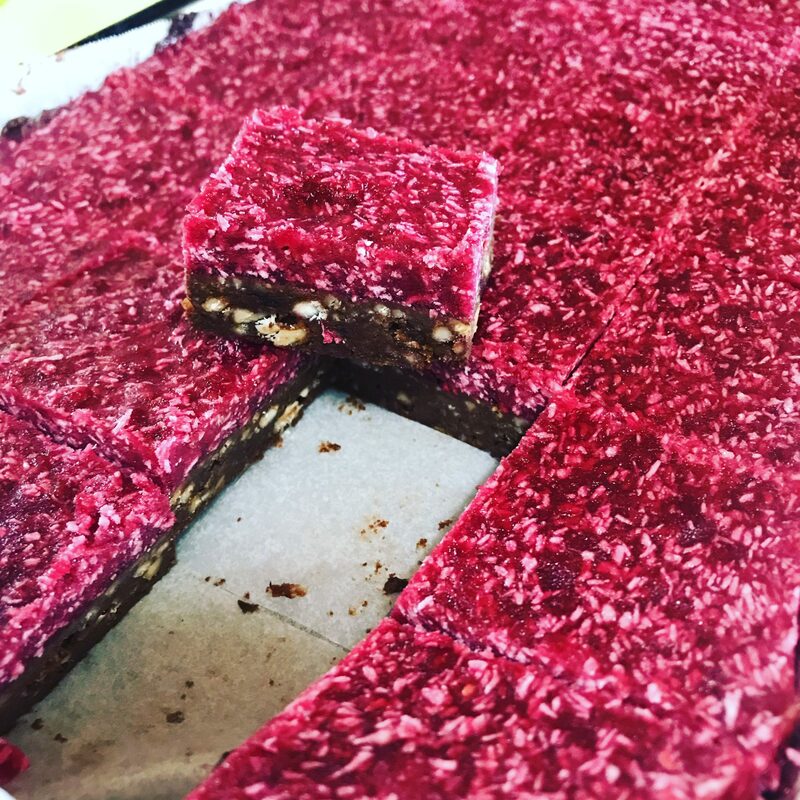 This recipe came about because my Mother had leftover raspberries that she didn’t want to go to waste – valid, given the price for local, fresh and of course the best quality raspberries you can get when in Northern Tasmania! For this recipe, I’ve triple confirmed that to form the macerated raspberry mixture all that Mum did was add the raspberries to a pot and stir until they were broken down – no additives. Apart from that, it’s super easy to make! Oh, and it’s been tried and tested on just about everyone who likes raspberries and the verdict is in, they all love it (well we wouldn’t publish it if they didn’t)! 250g fresh or frozen raspberries, cooked down. In a large blender jug/bowl, process the dates, almond, cacao and melted coconut oil until 80% smooth and any remaining nut pieces are small enough to smooth out in a shallow tray. Line a shallow cake/slice tray with baking paper and then smooth the base mixture out over the tray. Mix the macerated raspberry mixture with maple syrup. Add the agar agar to the boiling water and whisk until thick and smooth. Pour into the raspberry mixture and stir through. Pour the raspberry mixture over the base and freeze immediately.